9' Perfect Patio umbrella to help you keep cool and comfortable from the hot and harsh sun. Made of 100% durable polyester fabric, fade resistant,Water repellent, UV protection. construction，aluminum pole against rust, corrosion, chipping and peeling. FADE RESISTANT AND RAIN PROTECTANT: 100% durable polyester fabric,fade resistant,Water repellent, UV protection. Solution dyed polyester with color fastness last for 1000 hours,fabric is thick and strong for rains but not bigger wind, The fabric that is used for the umbrella is super water resistance and it won't get dirty so easily, Fabric will hold up a long time, and the stitching is high-quality. DURABLE AND STURDY CONSTRUCTION: made from a durable, powder-coated steel frame and 180G polyester fabric for long-term use outdoors, Built with a powder coated steel pole against rust, corrosion, chipping and peeling， 8 steel ribs on the top to keep it's shape, eight flexible sturdy steel ribs and mental pole are built support this Patio Umbrella, and ensure this umbrella is as durable as it is good looking. EASY TO OPEN AND CLOSE: Easy to put together and set up, it has a crank for opening and closing, Easy to open and close with the hand crank，the Patio Umbrella also easy adjust just press push button to tilt. Adjustable angle helps against the sun.this Patio Umbrella made from durable material but too not heavy so the Umbrella also easy carry and take.the cover also easy to clean.just loose the plastic cover of top. 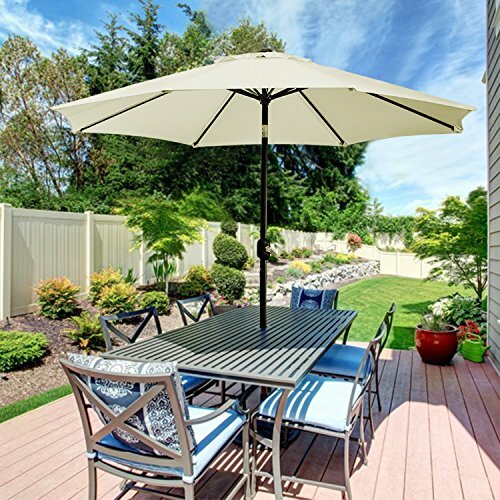 Ideal Shade Solutions: 9' Diameter by 7.8' height.- patio market umbrella provides 42-54 inches diameter of shadesquare or rectangle table with 3 to 6 chairs. Ideal for both residential and commercial locations, such as garden, pool, deck, porch, yard, lawn, backyard, balcony, restaurant, and any other outdoor area.